Mornings can be madness, but if you make a morning routine now, before the first day of school, they can be a whole lot easier. Making sure the kids are out the door with breakfast in their bellies, homework in their backpacks and their teeth brushed should be an Olympic event. It takes planning and practice to make morning routines run smoothly. It’s important to get sleep schedules and morning routines in place before school begins (even if your kids are old enough to get themselves ready and out the door). I know, not the best news you’ve received today, but it’s vital to starting the school year off right. A strategic morning routine will make everyone feel calmer, create more harmony in your home and allow you and your kiddos to get the most sleep possible. Establish what your morning time frame will need to be. If you think 45 minutes will suffice, see what it is like on a weekday morning at the time you plan on getting them up. Make a list of everything that needs to get done in the morning. Have your kids help, you can even make a check list (teeth brushed, hair brushed, supplements taken, lunch backed, backpacks packed…). If your children are showering before school or at night, make this part of the plan to. Ask them what they prefer..
Get Your “cast “ready. Think of this process as a dress rehearsal. You may be thinking “but what about bedtime?” Before you can establish your bedtime routine, you need to determine how long it takes your child to get ready in the morning. Think about the kinds of things that need to be done before you head to work and your child is out the door. Remind them the night before that you are going to have a “dress rehearsal” the next day. You can make this fun by saying we are practicing and making sure we have enough time, if we have more time then you can go to bed later or wake up later every day of the school year, but we’ve got to figure out how much time we need first.” This allows them to feel invested in the process, rather than you creating bedtime and wake time that they feel is enforced on them. Practice. I’d suggest doing a real life, timed, practice round to see if you need more or less time(fingers crossed)—do the whole routine. Practice as if it’s the real deal, a real school day. Make it fun and reward them with a trip to somewhere other than school: back to school shopping, the park or even a trip to the pool (bonus—less people will be there). This also reinforces how much you appreciate their efforts by rewarding them with something fun. Prep at night. Look at your list and determine what you and your kids can do the night before. Even with a seamless rehearsal the real performance could be a disaster if we don’t prepare ahead of time. Check the weather forecast before putting your kids to bed and pick clothes the night before. Lay out clothes the night before (two options in case the weather—or your child—changes his or her mind). This is a great idea for kids who have anxiety or sensitivities to textures as it gives them less options. This works really well for teens and tweens who notoriously change their minds at the last minute. 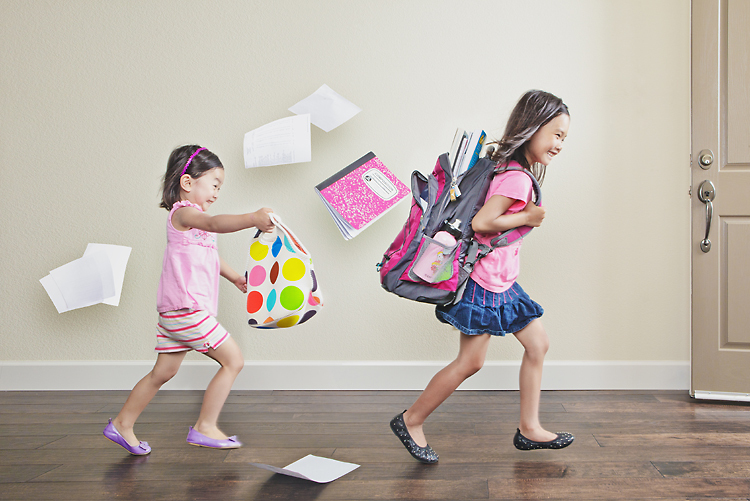 Pack backpacks and snacks the night before to help with morning grogginess and make sure nothing is forgotten. Also lay out supplements and snacksfor the upcoming day the night before (because they can sometimes be easy to forget). Praise them (and yourself). You may think that your child “should” know the routine by now, especially if your child is older. Remember that they have been out of the loop for a while, so be sure to praise their efforts. Complementing them and asking them for their feedback engages them in the process. Punishing and threatening them with consequences pushes them away and makes for much more anxious mornings and evenings. Remember you an only do so much. Each day has new challenges and adventures that we have to help kids navigate, but a simplified morning routine will help tremendously. We wish you and your family the best of luck this school year.